Yard House is a national chain of restaurants with dozens and dozens of beers on tap. The Chalkboard Series is a constantly changing rotation of beers, both local and from all over. The menu is vast and the atmosphere is lively. The Downtown at the Gardens location has a large bar centering the dining room with flat screens and tap after tap of beers available. There is outdoor seating both out front and back and you can see the bustling kitchen with its continuous flow of servers in and out. The menu has quite a bit of range from burgers to street tacos to an entire section dedicated to Gardein™. They have a great Happy Hour with discounts on drinks and select half priced appetizers and pizzas. This particular evening we were there to watch the National Championship football game and were seated at a high top. One thing I like about Yard House is that it is a good spot to watch the game that’s a little nicer than your average sports bar with a better selection of food and drink. We started with the Bearnaise Sliders, which are my favorite. Four mini burgers topped with fried onions and pickles, they are served with a side of béarnaise sauce and fries – yum. I went with the California Roll, which is an interesting take on the classic sushi roll. It is not a roll actually, but instead a sushi rice cake with snow crab meat and cucumber, topped with avocado and tobiko and served with soy sauce. 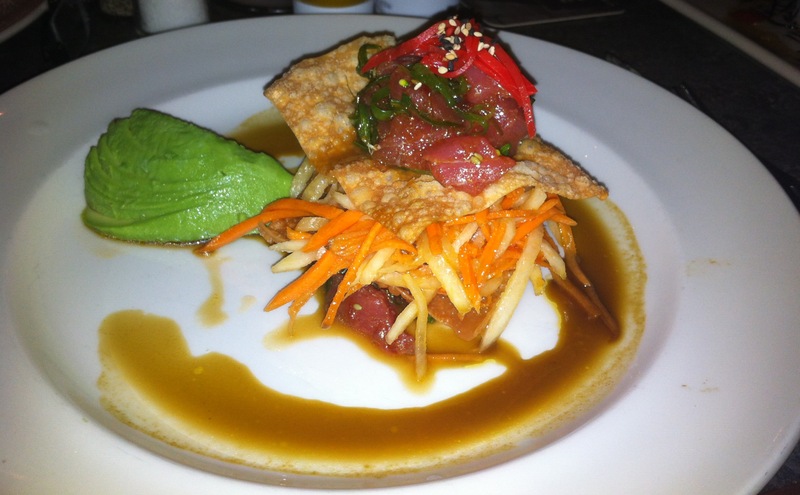 Lindsay had the Ahi Poke Bowl of marinated ahi tuna with avocado, carrots, radish, macadamia nuts and crispy wontons. Andrew had his usual Spicy Chicken Breast Sandwich which he always requests with lettuce instead of cabbage and no cheddar only jack cheese. It comes on a flatbread with cajun coli and a side of fries. Zach had the Parmesan Crusted Chicken served with garlic mashed potatoes, sun-dried tomato and three mushroom sauce. Beers around the table included the Rogue Yellow Snow IPA, Weihenstephaner Hefe Weissbier, and Gulden Draak amount others. Yard House is consistently good across the board for lunch, dinner, happy hour or a quick beer. They also serve wine and have a liquor bar. The service is good, the atmosphere is fun and the location is convenient.